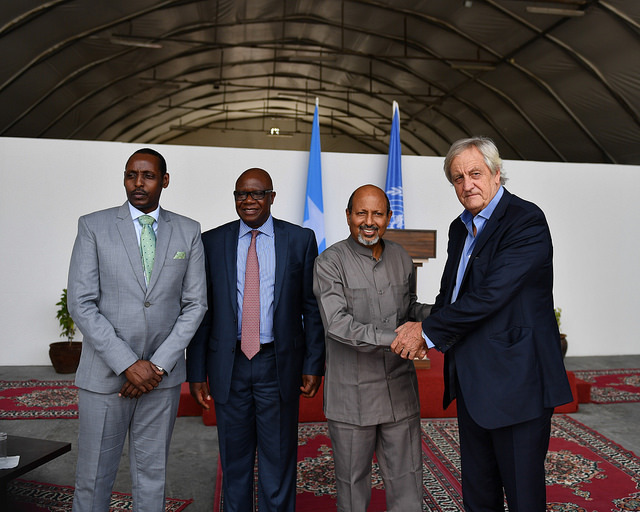 UN Special Representative for Somalia and head of the Assistance Mission UNSOM, Nicholas Haysom, has called for an end to a political “stand-off” between federal and state authorities in Somalia. The UN representative says that ongoing tensions between the Federal Government of Somalia (FGS) and the country’s state authorities risk undermining international and local efforts to end Somalia’s security and economic troubles. Haysom also highlighted the importance of “credible and acceptable” presidential elections next month. “What we’re facing is a quite serious political issue – the stand-off between the Federal Member States and the Federal Government may well paralyze our efforts to help Somalia get back on its feet,” Nicholas Haysom said at a joint press conference, alongside Sharif Hassan Sheikh Aden, President of South West State, and Francisco Madeira, Special Representative of the Chairperson of the African Union (AU) Commission. “We’re exploring ways of bringing them together in the hope that Somalis can face down their problems together rather than going separately,” he added. On November 17, Somalia’s South West State will hold presidential elections – the first of many local elections. Haysom expects the election to be “hotly contested” and feels it will set the standard for the elections that follow. Which is why he’s calling upon parties to accept the outcome of the polls and work toward building a stronger Somalia.